KUALA LUMPUR, 13/11/2018. Womens’ rights activists and students demonstrating outside the Parliament compound in KL, where they awaited the MPs for the signed petition presentation. Pix by Malaymail/ Hari Anggara. 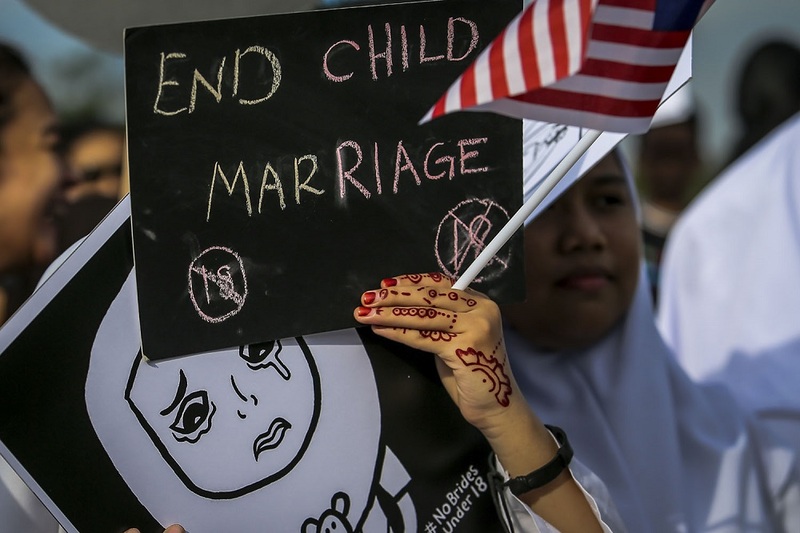 KUALA LUMPUR, Nov 13 — Over 80 demonstrators including women’s rights activists and school students marched to Parliament today to present a signed petition to MPs, urging them to expedite the banning of child marriage in Malaysia. By 8.30am the demonstrators had gathered before the compound’s front gate, with many holding placards and signs and chanting slogans. Among the demonstrators were primary and secondary school students, some dressed in Girl Guides uniforms. “Hey Hey Ho Ho, child marriage has got to go!” were among the chants heard. Shortly before 9am, a delegation of parliamentarians walked out of the gate towards the assembled demonstrators, including Segambut MP Hannah Yeoh, Sepang MP Mohamed Hanipa Maidin, Batu Kawan MP Kasthuri Patto, and Kuantan MP Fuziah Salleh. Several activists took turns to address the crowd, including anti-child sexual abuse NGO Monsters Among Us member Firzana Redzuan, 22. “We want to be heard as youths and children. The current practice is that there are too many exceptions to the rule, and weak guidelines followed by the Shariah and civil courts. “This leads to unsuitable child marriages. We need guidance from our elders who should not push for marriage thinking it will solve things, and by banning child marriage it is an incentive for youths and children to see the importance of education in this day and age,” she said. The petition, which accumulated 159,700 signatures of support, was handed to Yeoh, who is also the Women, Family and Community Development deputy minister. She expressed her appreciation at the public support to push for an end to child marriage in Malaysia. “The government listens, and we do what is in the best (interest) of the child. As it stands, we are making efforts to amend the Law Reform (Marriage and Divorce) Act 1976 for non-Muslims, and consulting the Malay Rulers and state governments on child marriage among Muslims. “We have also gone to Sarawak to speak to the state government on the practice of customary marriages. More importantly we are also speaking to the National Registry Department on solving the issue of children born to unwed teenaged mothers,” she said to loud applause. Fuziah also addressed the crowd, stating the National Fatwa Council had in 2014 issued a ruling stating that child marriages does more harm than good. “This is what the council has decided upon, and I will work to ensure this is realised,” she said.